Its my greatest asset and its my biggest character flaw. I accepted this as truth when I first heard it in 1998, and went from a “glass-half-full” person to a “glass-overflowing-and-spilling-out-all-over-my-shirt” person. 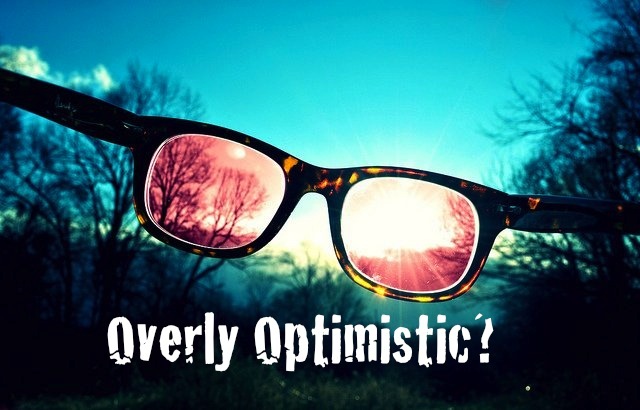 But over the years I’ve discovered that there’s a big difference between being positive and being “overly” optimistic. There’s a difference between being negative and being realistic. (And how I hate that word). Full disclosure: the last thing I’d ever do is encourage someone to be realistic . . . I mean, who would want to ever do THAT?! . . . BUT, there is definitely a time and a place for it. For example, I’m a horrible gambler. As much as I love to play most of the games at the casino, as much as I love poker, as much as I love professional football and fantasy sports, I lose a lot more than I win. Why? Overconfidence. I always think everything is going to go my way. I always think that I’ll get that five-of-diamonds on the river to complete the straight flush even though the odds are two percent. I always think “15 Black” is about to come up on the roulette wheel. I always think my team is going to comeback from three touchdowns down with 54 seconds left in the game. And my problem is, I REALLY believe it. Thank God I don’t gamble a lot! I always think the stock will come back. Why sell? I always think the pain will go away on its own. Why see a doctor? I always think tomorrow will be better than today. Well, <wink> I’m usually right on that one! The fact is, everybody’s life is better when they rock a pair of rose-colored glasses. But you can’t glue them to your head. Sometimes you have to take them off. An optimistic view on life is the greatest drug ever discovered. But when you’re in the quicksand, its not a great idea to smile and pretend you’re at the beach. As much as it pains me to say it, sometimes you have to examine the situation and be realistic. It’s important to look at life with extreme optimism. But sometimes you have to leave the driver in the bag and hit a five-iron off the tee.